Tired of drab gunmetal blue and black dominating your arsenal? Do a fashion makeover on your weaponry with The Bloomberg Collection of designer gun paints and camouflage. Wisconsin-based Lauer Custom Weaponry is honoring our hoplophobic mayor with a line of brightly colored paints for each of the 5 boroughs — Manhattan red, Bronx rose, Brooklyn blue, Queens green, and Staten Island orange. They even include a stencil of Mayor Mike’s face for the barrel of the gun. If urban camouflage is more your taste, Lauer also offers the Bloomberg Collection EZ Camo Kit with a brick-wall-and-graffiti motif for only $129. Not surprisingly, our ingrateful mayor doesn’t appreciate the tribute. “By coloring these guns, a real one looks like a toy, and a police officer won’t be able to tell the difference,” the mayor huffed. That’s the same excuse Bloomberg and his nanny-state allies used in 2003, when they tried to ban all toy guns from New York City — until the Manhattan Libertarian Party rode to the rescue. Of course, it’s a total urban myth that cops are shooting innocent kids because they mistake toy guns for real ones. There’s been exactly one documented incident in NYC since 1994 of a truly innocent child playing with a toy gun and mistakenly being shot. That was in the case of a deaf child playing in a darkened hallway who couldn’t hear the police order him to drop the weapon. The other “children being shot while playing with a toy gun” are inevitably gang-bangers using a fake gun to commit a real robbery. On the other hand, the police do sometimes mistake a wallet or a cellphone for a gun, with deadly consequences, but so far they haven’t called for a ban on wallets and cellphones. As of 2006, anyone who uses, buys or sells a gun-coloration kit in New York faces a year in jail or a $1,000 fine. Here’s a modest proposal: How about the police refrain from shooting their own guns until they have positively identified a lethal threat? And by threat I don’t mean the mere presence of something that may or may not be a gun. Like say, oh I don’t know, a gun barrel pointed at person, the suspect refusing an order to drop the weapon pointed at a person, or bullets emerging from the barrel. you guys are idiots. this concept is like putting nail polish on a deadly weapon. i thought the point of a gun was for intimidation.the person staring into the barrel of the gun might not get that point when it’s painted “Bronx Rose.” then again, gun “enthusiasts” aren’t the brightest of people. next you should try edible paint so that if you’re going to kill yourself at least you could taste something yummy when the barrel’s stuffed halfway down your throat. Did anyone ever notice the anti-gunners are always the ones who are frothing-at-the-mouth angry? They wouldn’t trust themselves with a gun — probably with good reason — and they assume everyone else is just as unhinged. Wow msmanhattan needs to get out and meet some real people.Everyone who doesn’t share her views is an idiot and gun enthusiasts (80,000,000) aren’t that bright.Nope she’s no bigot. The only thing I ask is don’t come upstate.People like her are the ones we call citiots. Just to be safe if you ever need the police you’d better ask for an unarmed cop.You wouldn’t want to get one of those stupid armed ones. actually by “idiots” i was referring to the company that produced this product although jim and brian, you guys aren’t far off the mark. “Of course, it’s a total urban myth that cops are shooting innocent kids because they mistake toy guns for real ones.” wow, let me guess, you also believe science and math are total uban legends as well. don’t worry brian, i won’t be coming upstate. aside from cow tipping, inbreeding, and trailer park loving, there isn’t much going on. jim is a good example of this, considering his book’s title “The Wall Street Tycoons” is partially plagiarized from a far more successful and established author, Jennet Conant. and maybe the next time you’re taking head shots to for your profile you’ll consider a finer establishment than JCPenny. Way to stick it to the man. Those guns are sweet. msmanhattan you are so right about Jim and Brain, But you are totally mistake about cop shootings kids because of a toy gun. I’m going to assume you are from New York because of your name, if so you must not watch the news much since almost every year theres a toy gun innocent. msmanhattan, I can prove science and math are real. You, however, cannot prove that the innocent kids shot while playing with toy guns are real. Go ahead, google some evidence for us. We’ll wait. Never heard of Jennet Conant. But the head shot zinger hurt deeply. I hope you’re satisfied. msmanhattan, lighten up dude. Although I’m a gun enthusiasts I’m not in favor of painting my defense guns in bright colors. Maybe my competition guns I might. The orange might be great for hunters in hunting areas with mandatory hunter’s orange wear. Lol nice one jtroks….good call. I suppose msmanhattan wouldn’t understand the point as he/she ironically would probably know very little of firearms safety, just that they’re bad, go bang and kill people on the news. Watching Good Morning America made me sick this morning. Watching Amy Lauer being interviewed you could tell she was not very intelligent. More like a complete idiot. She couldn’t come up with any reason to have colored guns. She just proved that the society we live in has no concern for life and it’s these money hungry people can just set back and watch all the young kids buy the guns and think they are so cool. She obviously has no regards for the children that will be harmed by the guns because they think they are toys. Obviously she doesn’t have children. If she did and something happen to them. I bet then she would think it was pretty tragic. Maybe when she’s held up with one of the pretty pink ones she will feel better that it was pink and not black. She needs to get into another business. I am a police officer go to firearms training several times a year. We do shoot dont shoot scenario’s. While much of the public thinks of police as “shoot first and ask questions later cowboys”. Most of the mistakes made during these scenario’s show the opposite and officers are killed by not reacting soon enough. These guns will add to the indecision by officers allowing the shooter the extra seconds to kill the officer. I am interested to know how the NRA feels about these painted guns. I hope they show more concern for the police officer than they did with the legalization of teflon bullets. about a kid walking down the street who picks up that gun and……. old and a 11 year old.i would not trust my 11 year old to know the diffrence any more than my 2 year old.And im someone who talks to her kids about everything.mental note;warn child about new gun paint. “YOU CANT ALWAYS GET WHAT YOU WANT” Stick with the other millions of other firearms you can possess, atleast when a cop is staring down a barrel at you he’ll know what to do off jump. well i think that the bad guys are not going to have these weapons being most of there guns are stolen guns and the pro’s would never show off. the comp shooters like to have something diff. and would not leave there $1000+ guns out for there kids to get hold of. you sould always have you guns locked if you have kids anyway. plus what about bb guns that look more real than some firearms do, any one heard of airsoft take the orange end off or paint it and it looks real. now if some one was to try and point that at a police they will get shot, they have no time for chance. Ummm, do some people miss the point that this is paint? They banned one brand of paint… because of advertising. It’s basically Polane, which is still legal, as well as any number of other brands of paint that would stick to a gun. bloomberg should ban all paint. Then he should ban ink, not only might it be used to color a scary gun but someone might use it to write something scary. Mom – Kids buying guns? Where? Show me where “kids” are legally buying guns. I’m patient. Hmm, a company is painting guns in a pseudo-protest of a very antigun mayoral figure. Seems that this should be protected by both the first and second ammendments. Personally, I can think of one good reason to have a colored/painted gun: Because I would like to have one. I don’t feel I need to substaniate my reason any more than that. Why do you want a red car? Cops pull over red cars more-maybe we should ban red cars in hopes that police officers will oppress people any less. Hmm I tend to agree. I refuse to give any credence to scenarios where children casually come across one of these guns on the side of the road and not realising it is a real gun. I also think it unlikely a police office would become confused by such guns. Whether coloured or not, real or not, it is the experience of my research that if a police officer is threatened by a person of interest to them they will act anyway. I have no sympathy for anyone pulling a gun of any type on a police officer, this is threatening stupid behaviour and generally will only done by criminals anyway. It is this type of hypothetical that rarely or never comes to fruition that defines the gun control movement. There is a real and vital necessity of life being dangerous as a consequence of technological advancement. Technology will not be restrained, so as a consequence we have a massive danger in the back of the room; as long as it’s there, why not openly embrace it (the 2nd amendment) and make it fashionable? The lives of police officers are totally expendable. If they were not, they’d never be put in a position where they’d be killed in the first place. So, the color of the gun an officer is shot with is basically immaterial. Also, however, if we accept that a policeman’s life is fair game, so is his opponent’s, and so give him whatever exotic and colorful weapons he wants. Were cops throwing orange hand grenades around in lower Manhattan on my way to work in the morning, I’d be more interested in the day. So, 1) stop defending the police, 2) stop hating guns, 3) embrace the fashion inherent in weapons. Art is healthy, extend it into other realms of domestic policy. 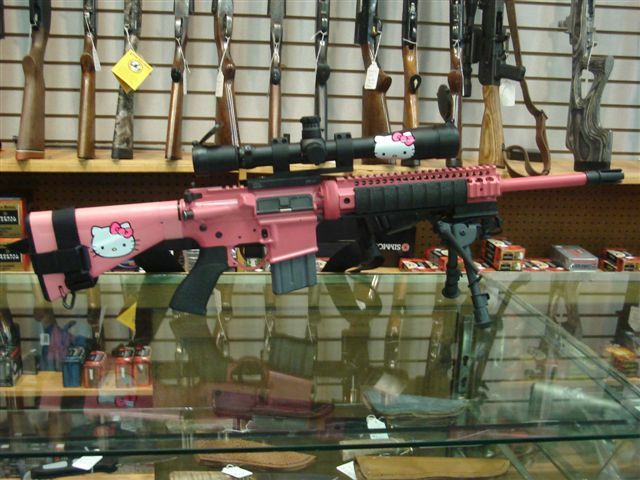 Well on the BB gun issue, its a little different. Yes theres bb guns and airsoft that look real but they dont fire real bullets that kill people. Even if someone pulls a fake gun on a cop he atleast has the judgment to fire at the person or not. But if someone has a gun the the officer gets shot. Lurking, Your comment is somewhat goofy about your kids. My mom told me to not cuss when i was young but i still do. Lauer, good for you. Please don’t back down on the paint issue that Bloomberg is pressuring you with. As a retired police officer, and firearms instructor, I alway instructed that a firearm is any gun, toy or real, that is pointed at you. Guns have been painted to replicate toys in order to gain an advantage on police. Anything that resembles a firearm should be considered real and dealt with accordingly. Todays police officers should take in account that firearms come in a variety of colors and/or threats, so ALL POLICE OFFICERS should expect that anything pointed in their direction HAS TO BE CONSIDERED A THREAT! Their families are depending on their training and if their department is not training this, they should bring it to their attention to start doing thisfor their safety and others. You have to train to keep your edge in law enforcement. Of course, nobody asks the important question: why is Staten Island double-action? I like the guns, besides some of the anti-gun people on here seem like they just want to be angry or trying to preach anti-gun propaganda to a pro-gun audience. By the way did you get lost on the way to the Brady Campaign website? I think the guns look nice and it has been proven that most gun owners are law abiding citizens. Also do you know how unbelievably annoying it is not to play an airsoft war with your friend because his anti-gun mom keeps acting disappointed or worried when you fire little plastic pellets at each other. The guns are even clear! but I’m getting off topic here I think the guns would be good if you were defending yourself on the street, of course I don’t know how it works in crazy NY but it really is just a joke I mean we all know Bloomberg hates guns and painting these guns and naming them after him is kind of an insult to him but it is still funny. By the way we aren’t all stupid, just the ones who by guns just to rob or murder someone but those people aren’t smart so they wouldn’t even think of urban camo. Besides if all gun owners were like you anti-gun people say they are you probably wouldn’t be alive to type your rant here. peace the kid has finally stopped talking to you :). Comments seem restricted from HTML but I’ll write the links anyway . DO NOT TRY : Comments seem restricted from HTML but I’ll write the links anyway . I like a painted gun. what should be banned is anything that have a shape that resemblance of a gun, such as an airsoft, a toy gun, model gun etc. etc. 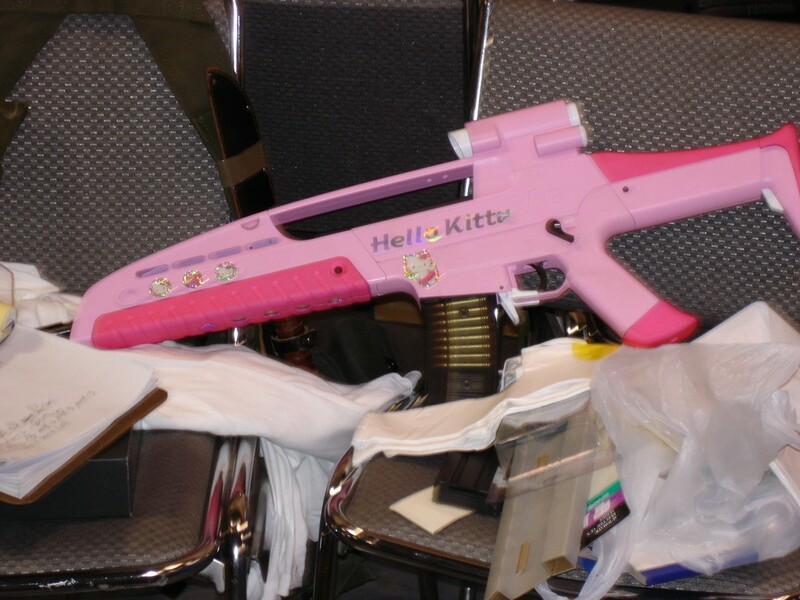 By banning this toys, there will be no more mistaken identity — and is easier to do than banning the real gun. Cops can tell when kids have toy guns BECAUSE they are bright colors. 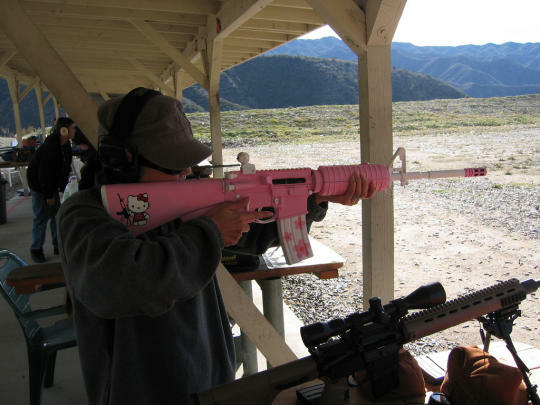 If everyone started carrying real guns that look like toys, what are they supposed to think, that they are all toys? Or that nobody with a colored gun is a threat??? I like guns and believe that people have a right to own them, but this is just stupid. The lauer company is trying to make a quick buck, no matter what dangers they present. Let’s burn all the books that mention paint! A little late to the party, but I’ll put my two cents in. I’ve been Duracoating firearms for approximately 4 years. What the anti-gunners and their ilk won’t point out is that Duracoat is not just a “brush on” product. It needs to be applied with and airbrush or HVLP sprayer & compressor (much like you’d see at an automotive shop use). Not only the application, but the preparation is a chore as well. Any grease or oil, the the paint will just rub off. Also, full cure time is nearly 4 weeks, parts can be reassembled in 24 hours however. Now antis – my question is this, at nearly $30 for 4oz, including shipping PLUS all the gear you need to apply it..don’t you think the CRIMINALS would rather just go to Walmart and pick up a $4.00 can of KRYLON?????? Wake up morons, we “shooters” know you antis look for ANY reason to go after the OH SO EVIL FIREARM. Obviously Bloomberg never did his research before going after Lauer either. Your idiocy knows no bounds.